Today I watched the hail and farewell for Adm. and Mrs. Mullen. The speeches were wonderful with sincere heartfelt appreciation. The Admiral showed everyone the love and respect he holds for Deborah, as well as his boys. He read his wife’s letter to the rest of us; the milspouses for whom Deborah Mullen has worked, advocated, and been a friend to. It is no secret, at least from anyone who has read anything I have written about Deb Mullen, that I am a great admirer of hers. Let’s be frank, I’m a huge huge fan. A couple of years ago, I was volunteering at a Congressional Military Family Caucus event and my post was at the desk where the nametags had been set out. Other Senior Spouses had come to the caucus, with advisors and aides trailing along behind. A woman approached the desk, and in a quiet voice let me know that the staff had misspelled her name. I looked up at a lady, with no entourage, who I recognized immediately. After we corrected her name, she sat at my table, we began to discuss with the other members of the group various aspects of military family life. At this function, only first names were used. The ideas came fast and serious, and criticism of senior military members was free-flowing. “Deborah” had to leave for a family engagement, and after she left some of the other table members were wishing she could have stayed. One point I asked didn’t any of you know who she was? No one else seemed to and were in shock when I told him who she was; Deborah Mullen. She was easy to talk to, had great ideas, and wasn’t shy about giving them. 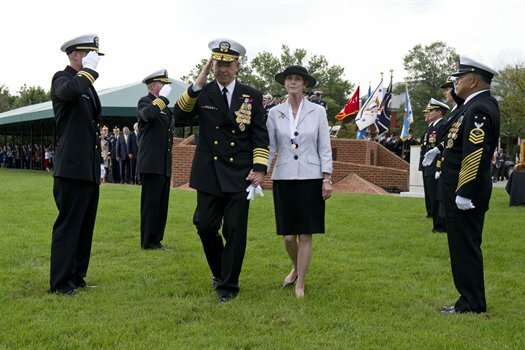 Today I watched as the Admiral and Mrs. Mullen held hands as they were “piped ashore”. We in the military spouse community are going to miss her, are going to miss both of them. I always felt that caring for military families was more to them than just a subject for speeches. Her gentleness and compassion were brought up over and over today. She may have been gentle, but the lady is no pushover. I remember her standing in front of a huge conference and asking how do you think you can help military spouse suicides when you aren’t even counting them. She didn’t overtly “ wear the rank” but her quiet authority was undeniable. I have read of her gentleness and kindness to the families of the fallen and wounded, and the care that she takes, e-mailing and writing to many of the family members. As Sec. Panetta said she has been at the forefront of issues, especially the special challenges of military children, she is a “powerful voice of military families”. While none of us begrudge her a quiet retirement, I can only hope she will continue to give us the benefit of her knowledge and compassion. In her words – we will miss her.